School sports day at Millway Middle School was always a welcome distraction from the rigors of secondary school education (you know, having religious texts forced down your throat and attempting to set fire to your mate’s hair with a Bunsen burner). It was also fun. Until I nearly killed a fellow pupil. It wasn’t my fault, I hasten to add. In fact, I’m almost certain it was his. As I neared the marker for the shot put, I glanced at the rows of kids and teachers lining the boundaries. They were all standing there in quiet anticipation, waiting for yet another attempt at what must surely be one of the greatest displays of manhood. I was excited, too. There were probably one or two girls amongst the throng and I was going to show just how hard I was by lobbing a heavy ball of metal across a field. I spotted a house a few hundred yards away, beyond the school fence. Perhaps I’d hit that. I took a run up (long enough to be illegal) and thrust the ball forward (incorrectly enough to be illegal) with all of my might. Heads slowly turned as it blasted through the dense summer air, spinning slightly on its axis, heading for a world record – a record I’m confident I would have broken, had one of the kids not leaned forward for a better view. As he did so, the rock-solid lump of metal smashed straight into the side of his head. He dropped to the floor, motionless. A crowd gathered. “You idiot, Mark!” could be heard, several times, possibly from a teacher. That moment he lay on the floor seemed to last an eternity. He didn’t move. I didn’t move. Curiously, the teachers didn’t move either, which, on reflection, doesn’t paint the best picture of their regard for health and safety. We all breathed a sigh of relief. I cancelled plans to run home crying. The teachers simply flicked me a synchronised look of despair. The sporting prowess I had displayed had clearly saved me from a detention. This was yet another memorable sporting event on the school field and, while it can’t be compared directly, the same rush of adrenaline was felt by millions of us on Saturday 4th August as Team GB picked up three gold medals in the space of an hour (although, thankfully, without attempting to kill each other in the process). I’ll say here and now that I have never witnessed such an amazing piece of sport than that of Mo Farah triumphantly making the 10,000m his own. Never before had this great nation won the event. Never before had such expectation and pressure been placed on the shoulders of a single, ordinary man. And he just did it. Seven days later he did it again in the 5000m, which is possibly even more astonishing. Likewise, Jessica Ennis has been the unfortunate recipient of the eternally irritating ‘poster girl’ moniker yet she too delivered, without any drama, a display of breathtaking athletic brilliance and will quite rightly be adored by a generation for a generation for doing so. The feeling of utter elation on that Saturday night was tangible. Until Gary Linekar suggested we watch the dieing moments of Team GB’s football match which had hit penalties. Which we lost. To South Korea. In an instant, Sturridge’s miss summed up everything that is wrong with our beautiful game. The giant spectre of our athletes’ brilliance has cast a formidable, dark shadow on the footballers of this great nation. I say this as a life-long football fan: they are absolute failures. Why? Let’s once again focus the spotlight on Mr Rooney. Here is a grown man who could not cope with pressure if it came with an instruction manual. Which is mainly because he probably can’t read. So, bad example. But the fact remains that, when asked to step up for his country, he fails, every time. Rather than get his head down and bust a gut like our boys and girls in white and blue, he stomps about the pitch like a spoilt teenager. There’s no denying he has the talent, which makes his blind ignorance to the hypnotic, emotional investment we as a nation place in those that are touched with sporting brilliance all the more unbearable. How we’d love to see him push himself to the point of breaking in order to grab a last-minute World Cup quarter final winner. How he’d be adored. Alas, that will never happen. I won’t compare salaries, because that’s an obvious target, but I will compare good, old fashioned humanity and sporting values, and the likes of Rooney and John Terry should be ashamed of themselves. The Olympic torch was put out last night. I’ll miss it more than I’ve missed any football tournament. I wasn’t looking forward to the games, but I’m now fully aware of what all the fuss was about. 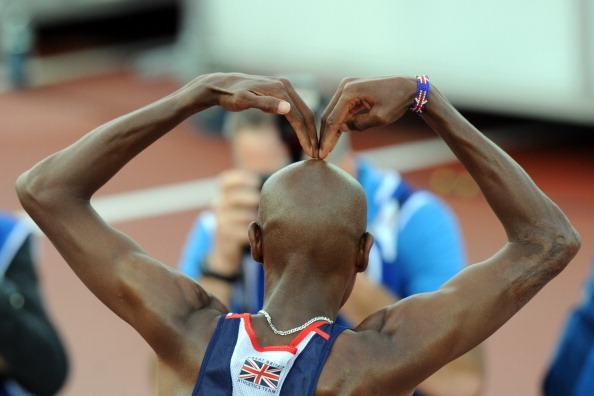 On reflection, it isn’t even the sport I’ll miss – its the people. Brilliant, talented, normal people who we should cherish for as long as they’re with us.